ETH researchers have discovered a molecule in liver cells that controls the release of fat into the bloodstream. This “lock keeper” is present in large quantities in overweight people and leads indirectly to vascular narrowing. Anyone attending Munich’s famous Oktoberfest will know it can leave physical traces; fatty foods and plenty of alcohol cause the liver to work overtime. This organ stores a portion of any fat consumed (and also converts alcohol to fat), but releases it again once the revelry is over. However, should the excesses continue — and if they are not offset by exercise and sport — the person becomes overweight and diabetic, leading to a condition known as fatty liver. If corrective action is taken in time, the liver can usually recover completely from its fatty degeneration. In severe cases the organ becomes inflamed — a condition that is almost impossible to treat. Fatty liver is also associated with elevated blood fat values. When the liver becomes fatty it seeks relief by releasing fat into the bloodstream, including “good” fat in the form of high density lipoprotein (HDL), but also “bad” fat, such as low density lipoprotein (LDL), and its precursor, very low density lipoprotein (VLDL). If the concentration of LDL and VLDL in the blood is too high, vascular constriction forms through atherosclerotic plaques. Should a plaque detach itself, there is a real risk of a vascular blockage, which results in a heart attack or stroke. 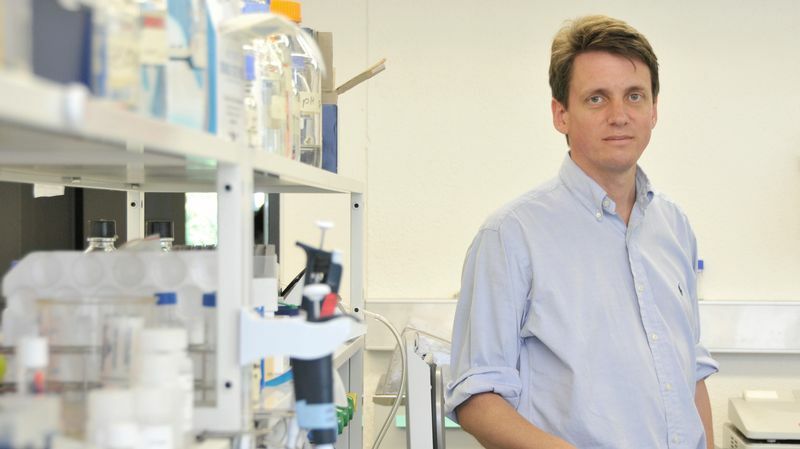 Markus Stoffel, Professor of Molecular Health Sciences at ETH Zurich, has been working with his team in collaboration with other scientists in Switzerland, Germany and the US to gain a closer understanding of the connection between excess weight, fatty liver and vascular constriction. And this has led to a surprising discovery: the scientists succeeded to identify a protein in liver cells known as vigilin, which acts as a kind of “lock keeper.” It regulates the release of fats, including VLDL, from the liver into the bloodstream. In a study that has just appeared in the journal Nature Communications, the ETH professor and his co-workers demonstrate that the primary function of vigilin is to regulate proteins that transport fat out of the liver. However, the molecule does not bind directly to these transport proteins, but rather to certain points of the associated messenger RNA. The messenger RNA is the transcription of a gene. It represents the construction plan for the associated protein and is transported from the cell nucleus to the ribosomes. These molecular machines use the messenger RNA to build the protein. The assumption is that vigilin supplies the ribosomes with the messenger RNA to which it is bound. But it is not just a transport vehicle, it also accelerates production of the associated protein. One of these proteins “promoted” by vigilin is apolipoprotein B (ApoB), which is responsible for exporting triglycerides from the liver. Triglycerides also promote vascular calcification when present in concentrated form in overweight people. In order to establish the causal relationship between vigilin and vascular calcification, the researchers stemmed formation of this protein in the livers of mice using a new process of RNA interference. As a consequence of this intervention, these animals suffered far less from atherosclerosis than animals who processed vigilin normally. By contrast, increased vigilin formation led to substantial deposits in the vessels. “Vigilin intervenes at the level of gene regulation, which has barely been investigated to date,” says Stoffel. Our knowledge of how genes are regulated at the level of DNA is improving all the time. And the regulatory processes by which DNA templates are transcribed into messenger RNA are increasingly understood. But regulation of the step from messenger RNA to protein is something we know much less about. This makes the knowledge that vigilin has a regulatory function at this level all the more valuable. And researchers are particularly excited by the fact that vigilin is the first RNA-binding protein found in the context of fatty livers and diabetes. The atomic structure of vigilin, on the other hand, remains a mystery, and is currently being studied by several groups around the world. Stoffel pictures the vigilin molecule as a kind of “octopus” with multiple arms — the molecule has 14 different binding points for one messenger RNA molecule. Each of these arms is capable of binding to a specific RNA domain and accelerating production of the associated protein. Researchers hope to extrapolate a possible treatment for fatty liver from this discovery. However, because vigilin can influence multiple proteins — the side effects of which are still difficult to assess — it is by no means a straightforward therapeutic target. Nonetheless, the researchers have filed a patent for their discovery. Stoffel believes that the pharmaceutical industry may consider this target if further studies are able to demonstrate therapeutic benefits in other models.